As the modern Spanish footballer is brought in at great expense and paraded in celebration, the first professional Spaniard arrived as a child refugee avoiding war rather than in search of fame and fortune. The Spanish Civil War had and is still having far-reaching consequences but one of its initial results was the migration of young Basque children into the United Kingdom. Bilbao-born Emilio Aldecoa was one of those young evacuees whose family deemed it unsafe to stay in his homeland after Franco had colluded to have Gernika bombed by the Germans. At the age of just 14, Aldecoa was one of 4,000 young Basques who escaped the country in 1937, moving to Staffordshire. It would not have happened if it was not for a surge of support from the British public to let the children come following the heinous bombings in Gernika. Those who travelled to the UK were told they would only be away for three months but many did not see their families again for a decade. The youngster integrated into life in his new home and was thrust into working at English Electric when World War II broke out in 1939. In his spare time the teenager would play football, the international game which helped him settle in England as it was a great leveller for refugees, especially ones so talented. Aldecoa played for ‘Basque Boys XI’, a team made of those from his homeland. It helped them integrate with locals as even without a common language, sport showed its force for good. No government funding was offered to support the foreign youngsters, who Prime Minister Stanley Baldwin had originally refused to accept, so they had to raise funds. Girls would perform traditional Basque dances while the boys played football matches against locals to earn money. As the war took hold there was no professional football but teams played regional friendlies. Aldecoa was spotted and signed up to play for Wolverhampton Wanderers. Aldecoa made his first appearance for Wolves in a 1943 regional match against Crewe Alexandra, which his side went on to win 2-1. At the culmination of the war, football slowly got back up and running. 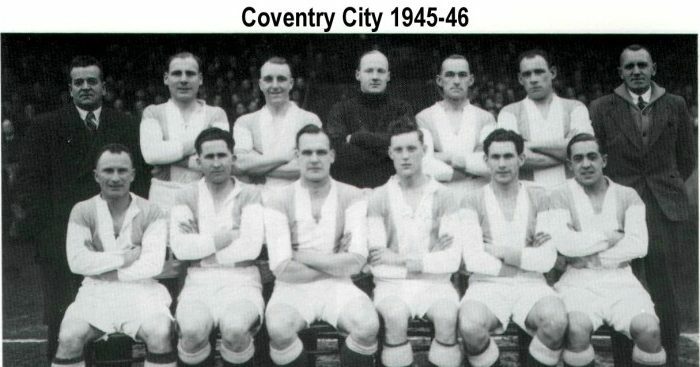 By this time Aldecoa had moved to Coventry City, where he would make his name as a winger in the 1946/47 season when football returned to play a full professional season, allowing Aldecoa to appear 29 times as a fully fledged sportsman. The Basque lodged with a local family where he assisted with DIY and showed further practical skills by doing building work at Highfield Road in pre-season. Coventry welcomed their new hero, who showed his undoubted skills on the pitch and was celebrated off it. He would get married in the city and locals celebrated by putting together their rations to ensure there was enough dried fruit to make a cake. Having been born in Bilbao, close to the club’s San Mames stadium, the lure of joining the iconic Athletic Club in 1947 was one he could not resist. Aldecoa would spend two years with his childhood club, helping them to consecutive sixth-place finishes and a Cope del Rey final. During his time back in the Basque Country he even earned an international cap for Spain but it would be his first and last as he featured against the Republic of Ireland. A spell at Real Valladolid earned him a move to Barcelona, where he played for three successful years, winning the league twice and also a Copa Latina, which was a forerunner to the European Cup, not to mention three Copa del Rey titles. Upon retiring, Aldecoa spent five different spells as Girona manager, which is a feat for anyone. But his relationship with England was not over as he returned in 1960 to be Gil Merrick’s assistant at Birmingham City. The Spaniard’s knowledge of the foreign game may have played a key role in the club’s progression to the Inter-Cities Fairs Cup final in 1961, where they unfortunately lost to Roma over two legs. He also expanded his knowledge by managing the youth and reserve teams while back in England. Fluent in English due to his time in the Midlands, Aldecoa returned to Barcelona in 1969 to act as manager Vic Buckingham’s interpreter for a two-year period which saw the Catalans win the Copa del Rey. The Englishman arrived with the team struggling and facing a relegation battle but he lifted them up the table and almost led them to a double the following season with Aldecoa at his side. A film was made to reflect the impact the winger had on the game, as he was one of six refugees who arrived in 1937 who went on to become professional players in England. He is emblematic of what immigration offers a country and not only is he a shining light to Spaniards who have gone to making a living in the UK but to all immigrants. The likes of David Silva, David De Gea and Alvaro Morata will never suffer the difficulties of their trailblazer but he certainly deserves a nod of a appreciation of what did for social integration and football during his time in England.